Cancer survivors gather for a photo at the 17th annual Hope in Motion Walk, Run & Ride June 3, 2012, at Columbus Park in Stamford, Conn. Photo by Richard Freeda. More than 5,000 dedicated supporters gathered Sunday, June 3, in Stamford's Columbus Park for the 17th annual Hope in Motion, Walk, Run & Ride event. The combined efforts of participants, volunteers and sponsors has led to more than $850,000 in donations to date -- once again making it possible to reach the event's $1 million goal. Hope in Motion is Stamford Hospital's year-round theme for cancer fundraising. This year, the initiative's signature event, the Walk, Run & Ride welcomed a surge of supporters. A total of 225 teams, more than 1,200 runners, 3,500 walkers, 250 riders and 200 volunteers, participated in the 5K walk, 5K run or 10-, 20- or 50-mile ride. 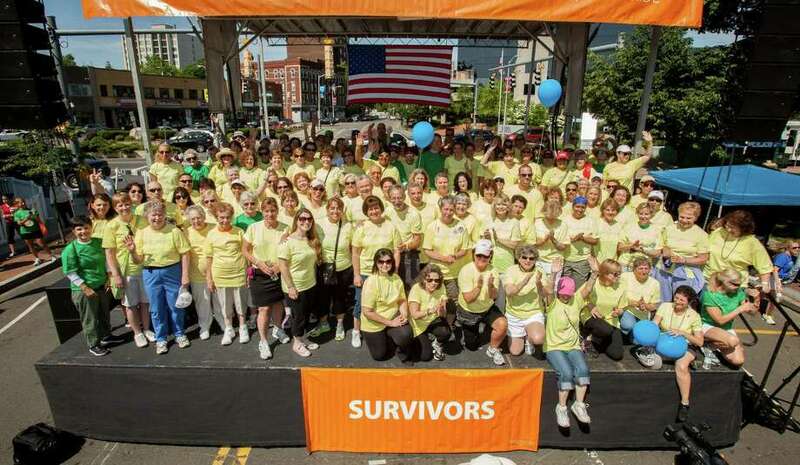 While participants created a sea of green in the streets, survivors donned yellow T-shirts and dozens stood side-by-side to pose for an emotional group photo as part of the day's festivities. Stamford Hospital's Bennett Cancer Center receives 100 percent of the proceeds generated from the annual event. Funds raised directly support the programs and services the center offers to its patients and their families, including: support programs, a post-treatment exercise program, nutrition education and consultation programs, transportation, integrative medicine, genetic counseling and survivorship and Nurse Navigation programs. "The turnout and efforts of everyone from participants to sponsors to volunteers has once again surpassed my hopes and expectations," Liz Manfredo, director of cancer services at Bennett Cancer Center. "I can't think of a better way to recognize our wonderful and courageous survivors, and mark the Bennett Cancer Center's 20th anniversary, two decades of serving as a resource to Stamford and the surrounding communities." For the second year in a row, Sock-it-to-Cancer was the top fundraising team and Craig Price was the top fundraising individual, raising over $25,000 and $17,509 respectively. Price participates in memory of his mother-in-law, Nancy Leferman, who was a Bennett Cancer Center patient. The overall top male runner was Ryan Hagerbrant, who finished the 5K in 16:48, while Hope Krause led female runners with a time of 16:59. "There has been large increases in program and service usage among patients and families at the Bennett Cancer Center, making it so important to keep our fundraising efforts up all year long," Erin O'Toole, manager of Hope in Motion, said. "It's inspiring to see our community come together in such a visible way. It's what makes this event so special and so important. It gives us an opportunity to fight back, contribute and raise awareness." Supporters can still make donations to the Bennett Cancer Center by hosting and/or attending any of the featured events, which range from bake sales to concerts and can be found on the event website. Funds donated toward the $1 million goal will be accepted through Sept. 30. Next year's event is scheduled for Sunday, June 2, 2013. To learn more about Hope in Motion and the Walk, Run & Ride event, visit www.hope-in-motion.org or call 203-276-5920.